The Super Bowl, the Academy Awards – must-see-in-HD events are often the catalyst for inviting your friends over to ogle your new HDTV. 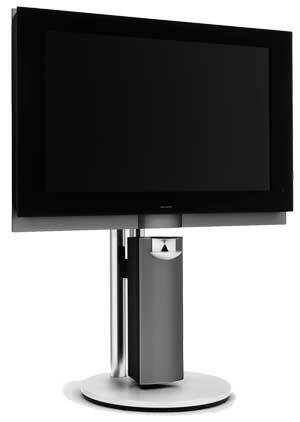 With the Bang & Olufsen BeoVision 7-40, the TV is the event. You won't need the NBA Finals or the release of the Dreamgirls DVD as a reason for a high definition party. The design and styling of this 40" 1080p LCD provides incentive enough. But BeoVision's beauty is not only skin deep. The picture quality of this just released Bang & Olufsen ranks as one of the best that we have reviewed. Of course, at over $13,000, you should expect nothing less. As an added bonus, an integrated DVD player is secluded away below the screen. Even though it only accepts SD DVDs, the upconversion to the 1080p display is almost flawless. Now, you will not be able to find Bang & Olufsen products at your local big box electronics retail store. Founded in 1925, this Danish company known for years for its distinctive audio equipment only sells its audio and video products through their branded stores, which are primarily located in major metropolitan areas. Usually in this part of the review, I begin my usual black bezel litany as I describe the all too similar features of this or that HDTV. To be fair, the BeoVision 7-40 also sports a black bezel, but that is about as far as the design similitude goes. To begin, the aluminum frame that accents the screen is available in a natural brushed finish or in black, dark grey, red or blue. Then behind the frame lies a curved, black lacquered cabinet that houses the video and audio processing guts and the extensive connections panel. Also back there, out of sight, is the DVD player. To load a DVD, you press a bump of a button hidden on the underside below the screen. A little curved door descends and a thin illuminated silver armature tray silently rotates out to accept your DVD or CD. Very cool. 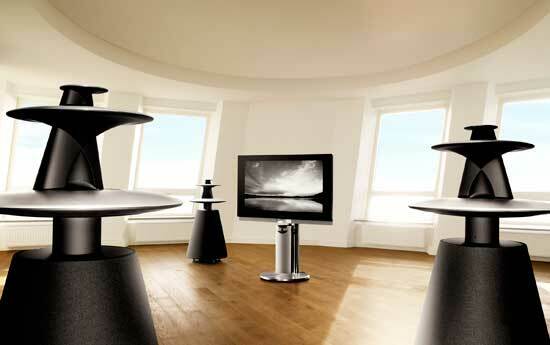 But if you are familiar with the aesthetics of Bang & Olufsen audio products, you come to expect way cool. Innovative design remains a cornerstone in their video line, which continues to exemplify their vision: "Courage to constantly question the ordinary in search of surprising, long-lasting experiences." Our review unit came with the elegant, (of course), vertical BeoLab 7-4 speaker, which performs admirably as a single TV speaker. It can also be used as the center channel in a surround sound setup. The other option in the base price is the BeoLab 7-2 horizontal stereo speaker, which may serve you better if you do not opt for a full surround system. With both the 7-2 and 7-4, you can choose an aluminum finish to match the TV's frame. You wonder what is making it so heavy until you remember that the stand is a motorized articulating mount for the screen. In other words, it can tilt the TV up and down and swing it left and right at the touch of a button on the remote control. If you really want to amaze your audience, then you can set the TV to a rest position when it's turned off. 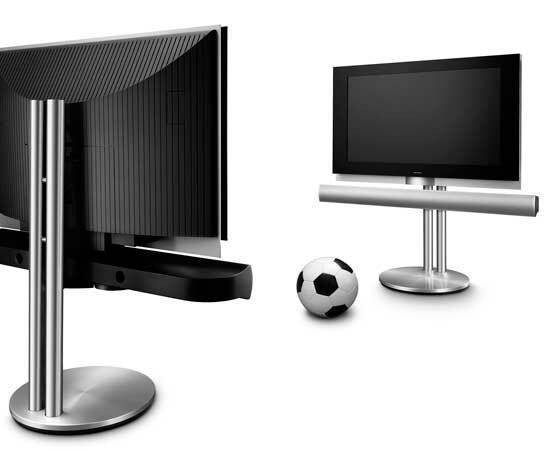 Then when you power it up, the stand will automatically rotate the screen to a viewing angle that you predetermined. Granted, if you are under the influence, it may be too surreal as the TV stealthily seems to find you in your seat; but in a more sober moment, you will appreciate the thoughtful design. And as the cherry on top of the whipped cream, the first image appears on your TV as black video "curtains" open and the sound fades up. You can begin to see why I say this TV is the event. The connection panel contains a wide range of inputs for a host of functions. To begin, there are four HDMI, two Component, one VGA, one S-Video, five Composite and two Antenna inputs. The Bang & Olufsen speakers have their own Power Link connectors, one Center, one Sub, (which can be split into two), and five Surround. Also, one Mini jack is furnished for stereo headphones. 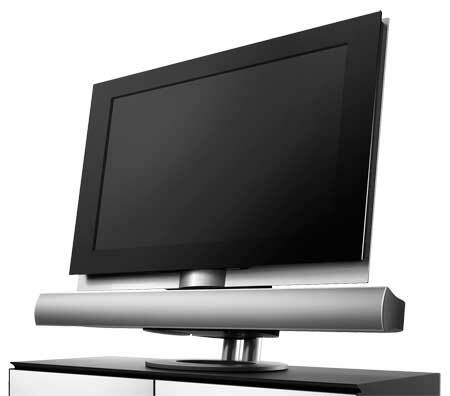 The TV includes both an ATSC and an NTSC tuner for receiving over-the-air (OTA) signals. One of the RF antenna inputs feeds the ATSC, the other connects to the NTSC. The channel scanning function is fairly standard, though you can group channels into meaningful divisions, like News, for easier browsing. The panel also provides connections to interface other devices. For example, you can run a wired IR emitter to a set top box from the IR in and then control the device directly from the BeoVision's remote. If you have a home cinema setup with a projector, you can route the video from the TV through the DVI-D Out, and then control the projector, as well as lighting and curtains, through links on the connector panel. As you would expect, all the connections are concealed behind two removable curved black lacquer panels. 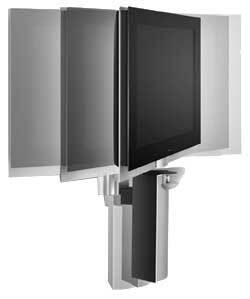 Even though you can attach the BeoVision 7-40 to a motorized wall mount, this HDTV was designed to be appreciated from all angles. With all the options, the multifunction remote control can be a bit daunting, made more so by B & O's "courage to constantly question the ordinary." After picking up the remote and searching for the DVD Eject button, I realized I was not dealing with the ordinary. First, the metal cased remote is heavy and feels more substantial than its more pedestrian plastic brethren. Second, not all of the usual buttons are on this remote, or at least, not labeled or located where they normally would be. For example, to mute the audio, you press in the middle of the Volume rocker button. Unless you were born with the Danish design gene, the remote requires some study, though the small screen at the top does assist you by indicating what function you have selected. Also, a text display to the right of the TV screen does provide information like Volume level when you press the Volume button. And after using the remote for awhile, you start to appreciate the thinking that went into its design. Following along with the theme of this review, setup was also extra ordinary. Usually, a box arrives at our testing facility and we are on our own. With the BeoVision 7-40, a Bang & Olufsen installer drove four hours from the nearest dealership to perform the basic wiring connections and remote control customization. With all the options and the idiosyncratic nature of the remote, setting up the BeoVision can become rather complex. I was happy to have the installer, especially after I discovered that the User's Guide really doesn't address Setup issues. Simply, you need a knowledgeable installer to setup this TV. But let me remind you that this is a $13,000 piece of equipment. It's not something that you take home in your SUV and install with a friend. As I reread this, I feel that I'm giving the impression that the BeoVision 7-40 is not a user friendly TV. For everyday use, it's simple. Pick your source on the remote, like TV, and hit Go. But with a feature rich device like this, you should expect a learning curve if you delve into the depths of its functionality. I was interested in how the installer would calibrate the TV. He said that he sets it according to the customer's preferences. So, he didn't whip out any fancy colorimeters or test patterns. B & O's Product Manager, Dave Zapfel, told me that the TV is calibrated at the factory, which explains why the picture looked great straight out of the box. Zapfel feels that setting up the TV is not something their customers should worry about. Considering that the BeoVision 7-40's video processors contain a lot of adaptive picture circuitry that is dynamically adjusting the image, most customers shouldn't have to visit the Picture Menu. If you do venture into there, the BeoVision 7-40 provides only the basic controls: Brightness, Contrast, Color, Tint, and Size. There are no Sharpness, Color Temperature, or Picture Mode (Movie, Vivid, etc.) controls. By punching a key combination on the remote, you can access the Setup Menu, which contains all the subtle picture tweaking features that you can imagine. Be forewarned, you should definitely never fiddle with the Setup Menu unless you are ISF certified. But all the sophisticated circuitry and calibration does not guarantee that the TV will be perfectly attuned to your taste. Depending on how persnickety you are about your TV's color and contrast, I would suggest that you be present when the installer is setting up your TV. And like a good Scout, be prepared with your favorite DVDs or TV channels. Play them while the installer is still handy to see if the BeoVision 7-40 is calibrated to your preferences. Don't assume that the reference monitor in Denmark matches the reference image in your head. For example, our initial impression of the picture was that it exhibited the tell tale characteristics of a TV set to Movie mode, (muted colors, brightness and contrast), which is not our favorite. (And indeed, when we peeked at the Setup Menu, Movie mode was turned on.) We prefer a little brighter image with more contrast - though nothing nearly as garish as the Vivid mode option that you find in other HDTVs. So we pumped the Brightness a couple of notches and Contrast even a couple of more steps. Also, on some DVDs, we could perceive a slight bit of edge ringing, which we attributed to a smidge of over sharpening. We found the Sharpen control in the Service Menu. When we dropped it a couple of ticks, we were happy. Actually, that is an understatement, we were tickled pink - even though that may not be an appropriate response for a reviewer. Back to the point about the installation, what looks right is very personal. Some people yearn for the sharpness that we tried to reduce. But if you preferred less sharpness, you really couldn't make that adjustment since Sharpen is not an option in the basic Picture Menu. So spend some time with your installer to adjust the picture to your tastes. One last comment about setup, since the BeoVision 7-40 does dynamically adjust according to your environment and your programming; very rarely, you may notice your picture will shift in brightness. We observed it when we were feeding it static test patterns. The shift is usually imperceptible, but it is just a characteristic of those circuits keeping attuned to the brightness of your room and the shifts in your source material. 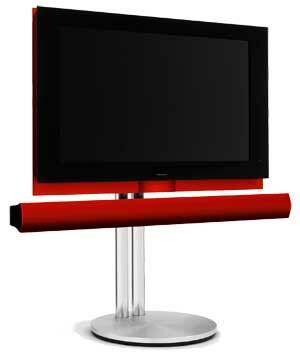 Considering the sleek, artful styling of the BeoVision 7-40, you would anticipate state of the art performance. This Bang & Olufsen LCD delivers with a rich, beautiful image worthy of its sculptural framing. We have the new Toshiba HD-A20 HD-DVD player in for review and we popped in the visionary V for Vendetta HD-DVD . When the vengeful V takes Evey up on the roof and blows up the Old Bailey to the strains of the 1812 Overture, the image was combustible. We flipped to Star Wars: Episode 2 playing on HBO HD and you could almost taste the Tatooine grit. And the Equator HD documentary on chimpanzees was sublime. Even standard definition TV programs looked good on the BeoVision 7-40, though we will never say that SD channels look "great." A real pleasant plus to this Bang & Olufsen unit was the outstanding performance of the integrated DVD player. It can only play back SD DVDs, but the upscaled, deinterlaced signal the BeoVision's video processor displays on the 1080p screen is remarkable. Its color fidelity and noise reduction of SD material is the best that we have seen. In The Return of the King, when Arwen confronts Elrond, the skin tones are uniformly pleasant, the costumes luxuriously detailed, and the shadows are subtly smooth. I'm usually not a big believer in combining DVD players (or in the old days, VCRs) with a TV. I always think the players will die long before the TV. But Bang & Olufsen designed this DVD player specifically for the display's video processors. The resulting picture quality attests that this technical union was wrought in video heaven. Now, just so you don't believe that everything is milk and honey, we discovered that when we hooked up the Xbox 360 with the VGA cable that the BeoVision 7-40 would not accept the 1920 x 1080 signal. We had to set the Xbox to output at 1280 x 720 through VGA. We prefer the VGA output of the Xbox, but since the BeoVision 7-40 does such a great job of deinterlacing, we didn't feel that we were sacrificing much by connecting the Xbox Component cable and feeding the TV a 1080i image. In fact, we have noticed on other TVs a slight shimmer in the body armor of the Gears of War combatants. We never saw that artifact with this combination. The TV does provide a side by side picture feature. 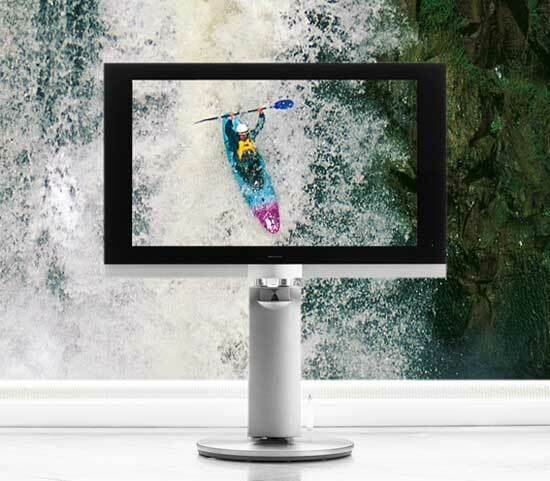 Unlike some other monitors that retain the original picture format, the designers at Bang & Olufsen decided to split the 16 x 9 format and to reshape the two pictures into almost a square. For normal HD programs, that entails a lot of horizontal squeezing, which should gladden body conscious actors. But the distortion dictates that you only use this feature for periodic channel surfing. Finally, as you would presume from a company with the audio heritage of Bang & Olufsen, the sound system on the BeoVision 7-40 is definitely an important element of the viewing experience. The vertical BeoLab 7-4 speaker is really designed as a center speaker in a surround sound system, though it crushes the competition of underpowered speakers that usually come bundled with HDTVs. For a mono speaker, it performs remarkably well. 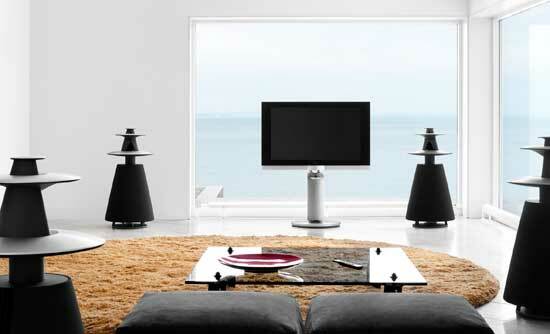 If you are thinking home theater, then we would suggest splurging on a set of four BeoLab 5 loudspeakers. We heard them at B & O's suite at the Consumer Electronics Show and the sound massaged our eardrums with kid gloves - as they should for almost $20,000 a pair. Moreover, you will need two pairs! The BeoLab 7-4 was made to complement these speakers. Of course, if you are not a successful hedge fund manager or are constrained by space, then we would suggest that you order the horizontal BeoLab 7-2 speaker instead of the BeoLab 7-4. The 7-2 houses true stereo speakers and, as such, is a better stand-alone solution. Zapfel noted that the 7-2 is wider than the BeoVision 7-40, which allows the internal tweeters to be farther apart giving better stereo separation. After reviewing a parade of look-alike HDTVs, we ached to find a stylish departure from the norm. 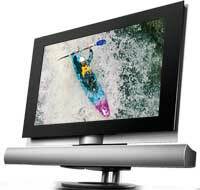 The BeoVision 7-40 soothes that pain with an unmatched combination of design and performance. If we had one regret, we would have preferred a larger screen. Bang & Olufsen, please make a Beo-Vision 7-47 or 7-52. First, realize, that ratings are relative to when the review was written. The obvious example is Value, what you could purchase for $2000 two years ago or even two months ago would seem like a bad value for that price now. Second, before today, we have given only two 5 Star ratings, which we reserve for truly outstanding accomplishment. We could quibble here or there with minor issues, but overall the performance of this 1080p LCD was exemplary. If we had any qualms about giving a 5 Star mark, the quality of the upscaling DVD player firmly establishes the Beo-Vision 7-40 as an over achiever. With the integrated DVD player and a Beo-Lab 7-2 stereo speaker, Bang & Olufsen has assembled a complete package with all the features necessary to satisfy even the most discerning. Do I wish for better PIP? For me, not really. And for those videophiles who twitch if they can‘t tweak, the Setup Menu offers all the controls you could desire. This category presents a challenge for us. Setting up the TV is not easy, but you won't be doing it, an installer will. So, how easy is that? And if you have questions after the installer is gone, we found Bang & Olufsen's technical support was informative and courteous. But the remote, reflecting the multiple features of the Beo-Vision 7-40, is not as simple to navigate as other more uni-function devices. But with on-screen guidance and a little practice, the remote becomes second nature. How do you rate the value of this $13,000 piece of equipment? If we were simply comparing it to a high quality 40" 1080p LCD - even throw in a great DVD player and dynamic stereo sound - we would conclude that you could find better value elsewhere. But if you are like us, and appreciate the importance of great design, then the Beo-Vision 40-7, as a sculptural coalescence of art and technology, gracefully justifies its cost. I must confess this TV is a master piece. It will standout for years to come. Though very pricey, the experience makes you forget the price. Please can you help my controller doesn't change over to channels and the free view doesn't work.! Please can someone help me with this problem. BAD & slow respond of channel change. Very bad RCU design. TV ON/OFF need my valueable time. It is old techology TV. I bet if you were to spend another 7-10 days using the Beo4 remote, and truly live with it, you would increase the star rating to a full 5 (and learn to despise all other plastic run of the mill remotes out there).